Nestled in a picturesque little courtyard off the beaten path in downtown Orillia, in the heart of the Arts District, Tiffin’s Creative Centre has a lot to offer businesses and individuals alike. 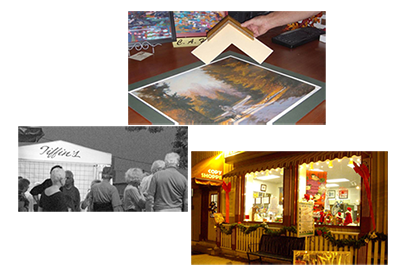 Serving the Orillia community for over 30 years, Tiffin’s has the equipment, knowledge, experience and products to help creative people bring their ideas to life! We offer a full line of copying, design & finishing services in our Copy Centre. Our Art Centre proffers a distinctive selection of home décor with an artistic flair. So whether you’re building a house, a business, a project; or creating a home, a space, or artwork, we have the quality products and personal services you need, at a cost effective price. Come on in and see what we can do for you! We help creative people bring their ideas to life. Copyright 2016. Tiffin's Creative Centre. Web Design by Fireside Agency Orillia.